TAKE CHARGE OF YOUR LIFE WITH THE FEAR OF PUBLIC SPEAKING HYPNOSIS MP3!!! The Fear of Public Speaking Hypnosis MP3 session helps to overcome the fear of public speaking by helping you first to relax. The relaxation methods that introduce the hypnotic stage of a self hypnosis program can also be used to prepare and calm your self before the actual speaking event. However, hypnosis goes a couple of steps further. It is able to change the way you think about yourself, your audience, and the event of speaking in public. Steve G. Jones, Ed.D., Clinical Hypnotherapist, charges $1,500 for a custom recording and $25,000 for a one-hour private hypnotherapy session at his office. But you can get all the benefits for this low price. Simply listen to the Fear of Public Speaking Hypnosis MP3 download every night as you go to bed for three weeks and feel the changes happening in your life. You will feel more empowered, more in touch with your true self, and you will truly know that your goals are within your reach. Steve G. Jones achieves AMAZING and LASTING results!!! Hypnosis is the easiest way to affect change in your life because the positive messages go straight to your subconscious mind effortlessly so you can accomplish your goals and reach for the stars!! All you have to do is listen to the Fear of Public Speaking Hypnosis MP3 audio at night as you go to sleep!!! You’ll hear soft music, the gentle sounds of the beach, and the soothing sound of Steve G. Jones’ voice all working together to bring about positive changes in your life easily and naturally. Steve G. Jones has been helping people improve their lives with hypnosis for over 17 years…now it’s time for him to help YOU… don’t wait, do it NOW !!! you’ll be glad you did. See you at the top! I once read that Americans rank their number one fear as the fear of public speaking; which is ranked right above the fear of dieing. So does that mean that the average American would rather die than speak publicly? I sure hope not! Overcoming the fear of public speaking takes practice and it also takes confidence building. Most people are scared of public speaking because they don’t want to make a fool of themselves in front of a lot of people. However, it is usually this lack of confidence that leads to mistakes. The key to overcoming the fear of public speaking is to be okay with a mistake and to quickly move past it when it occurs. If you have to make speeches frequently or presentations at work, there is going to be a time where you might mix up a few words or not know how to answer a question, but confidence in public speaking will help you move past this fear. Realize that when you are speaking to a large group of people, you are your worst critic. So learn to go easy on yourself and overcome your fear of public speaking. I would like you to imagine yourself speaking publicly. That’s right, just imagine yourself up in front of people and speaking publicly. And you imagine that as you continue to speak, your fear is continuing to leave. That’s right, you are allowing it to leave. Your fear has been considerably weakened and what little is left is going away completely. It is almost gone. And now your fear is completely gone. And you can feel a great sense of relief. And I want you to understand from that now on when you give a speech you will be very, very relaxed. Before you give a speech you will take a deep breath, in through your nose…and hold it, open your mouth slightly and exhale very slowly. And again a deep breath in through your nose and hold it, open your mouth slightly and exhale very slowly. And a third time, a deep breath in through your nose and hold it. You will open your mouth slightly and exhale very slowly and these three deep breaths in and out will be a signal to your subconscious mind. A signal that you are very, very relaxed and as you do these three deep breaths, in and out, you will recall a time in your life when you were very much in control, feeling very powerful, feeling very centered and focused. That’s right, and all your fear will leave. And you will be flooded with a sense of confidence and power and focus and serenity. And you will deliver your speech easily and effortlessly, everything you have prepared will come to you. If you are speaking spontaneously, ideas will come to you easily and effortlessly. And very soon indeed, you will find that you are an expert at public speaking. You are an accomplished expert at public speaking and that feels wonderful, because you are able to relax ahead of time, you will be able to concentrate completely on what you have to say and as soon as your speech begins, you will be relaxed. You will be calm and at ease. And you will become engrossed in what you have to say. And you will forget about yourself completely. When your speech is concluded, you will be full of the warmth feeling of accomplishment which seems to come from that knowledge that you have done well, that’s right. And as time goes on, this realization of how well you are actually doing will cause your former anxiety to disappear, to become less and less until it is gone completely, gone completely and you are so relaxed while delivering speeches, so relaxed and focused and comfortable and confident while delivering speeches and that feels wonderful. The fear of public speaking is a very common fear. In fact, very few people actually enjoy it. The key is knowing how to appear like you enjoy it! To be a good public speaker you must have inner confidence and appear to have outer confidence. Most people who are scared of public speaking get hung up on what they will look like and what they will say. They do not want to say or do something stupid. The Overcome fear of Public Speaking self-hypnosis recording will help you to get past your negative thoughts! This powerful Fear of Public Speaking Hypnosis MP3 session will teach you to be confident and charismatic while you are speaking. Whether you are talking to one person or thousands of people, hypnosis can help you overcome your fear of public speaking. You will be taught to visualize yourself giving your speech or speaking in public and hypnotherapy will allow you to feel comfortable with the idea of public speaking. The most important skill hypnosis will teach you is to remain relaxed and confident at all times. Hypnotherapy will also teach you that you do not have to be perfect to be a great public speaker. Everyone messes up and your confidence will allow you to bounce back quickly no matter what mistake you make. You can do it! Having a fear of public speaking is the #1 fear that people list, so you are not alone. 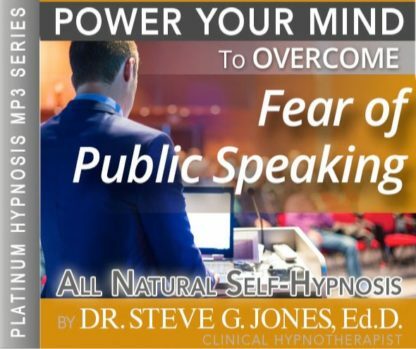 This powerful hypnosis program will not only help you overcome your fear of speaking in front of people, but help you become a fantastic public speaker. This hypnosis session will bring out your inner confidence and charisma. We suggest you listen to this program for 21 nights in a row before a public speaking event. This hypnosis program will properly prepare you to give a great speech. You will feel confident and relaxed as you talk in front of people. You will have confidence in yourself and your abilities to be a great speaker.